Some days I drive a Camry. The life of a professional automotive journalist is filled with driving experiences, as you guess. And if I’m being true to the market I intend to cover, that means more miles logged behind the wheels of compact sedans, small crossovers, and pickup trucks as it does adrenaline-fueled apexes on windy, cliffside roads kissed by ocean air. For car nerds like me, all cars, basic to brash, are interesting subjects. ⠀ 2016 Land Rover Range Rover SV Autobiography | Why Buy? That said, some days I drive a Bentley. And not just any Bentley, but one with 600 horsepower. 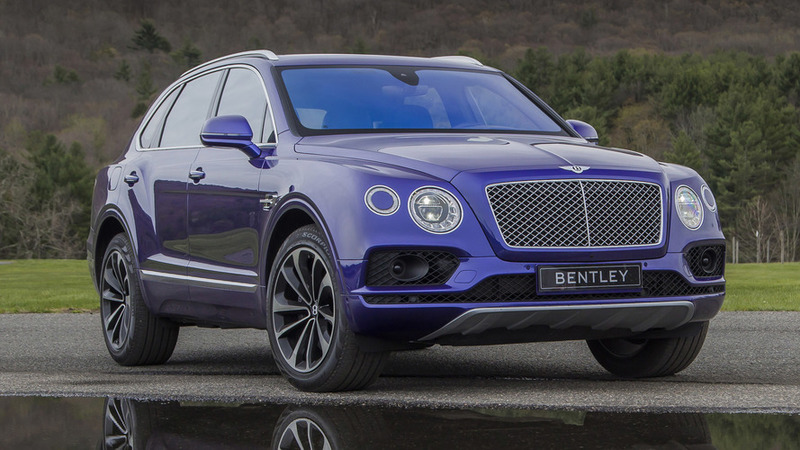 And not just any 600-hp Bentley, but the company’s first SUV. And not just any 600-hp Bentley SUV driving, but driving on a racetrack tucked in the money-green hills of the winding Connecticut countryside. Those are good days, too. Truth be told, I didn’t arrive in New England particularly well disposed to like the Bentley Bentayga. My reaction to the development and deployment of the utility vehicle was typically grouchy, with the fact of the vehicle’s ostentatious styling not much improving my mood. The strong haunch over the rear wheel successfully conveys the power available. 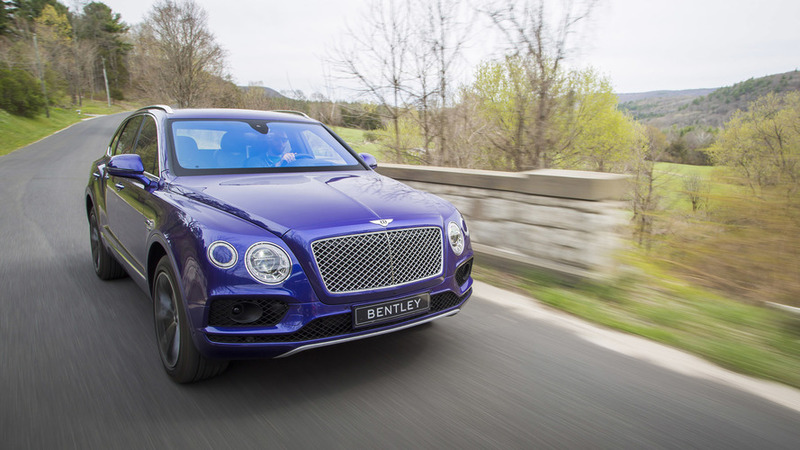 Designing an attractive SUV is a tough task, and doing so with the requirements of Bentley’s world-famous, brick-flat, chrome-slathered corporate face makes it harder still. In person, the height of the front end combined with the prominent grille looks unsettling to me – as if, despite the short front overhang, it might nose over, unprovoked, in the parking lot. 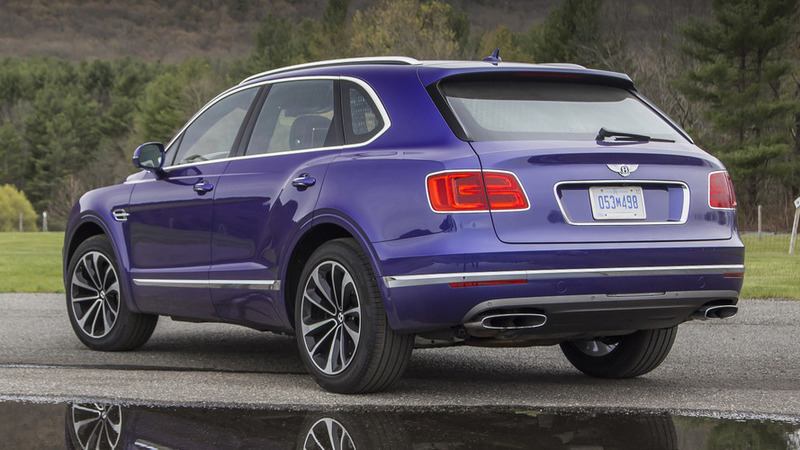 The view is altogether more pleasing when it comes to the Bentayga’s strong profile and muscular rear views. Here, the strong haunch over the rear wheel successfully conveys the power available, and the more conventional silhouette is pleasing to apprehend. Perhaps saving the more attractive view for the backside is by design: the tanky vehicle is certainly quick enough that most other drivers will see it pulling away. I may have gotten behind the wheel of Bentley’s first-ever SUV feeling somewhat sulky about the very idea, but I was quickly liberated from my misconceptions. 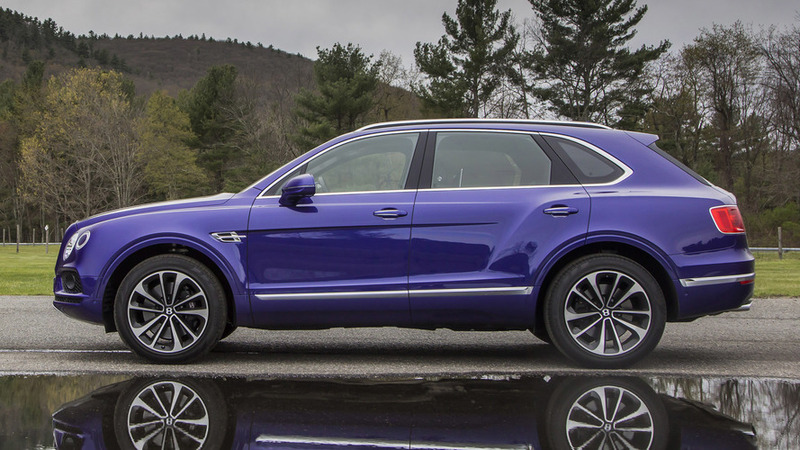 I’d driven to our Connecticut staging area from New York in a Bentley Flying Spur, and it took all of about 90 seconds in the Bentayga to realize how much more refined it was than that sedan relation. Even an iPhone speaker could make this space sound like a concert hall. From the silky hiss-click of the soft-close door to the ignition and then prolonged abuse of the masterful biturbo, 6.0-liter W12 engine, the Bentayga is a study in hushed and rapid travel. Wind and tire noise have been all but banished from the cabin, and any crackle from the twin, ovoid tailpipes is allowed in only as you dictate with your right foot. When I so chose, Bentayga was ready with an ungentlemanly level of acceleration from a stop – the 4.0-second 0-60 figure hardly does the experience justice – and a randy exhaust note. But when I leveled off the throttle the silence was so complete that the notion of opting into the 22-speaker Naim stereo system seemed preposterous. Even an iPhone speaker could make this space sound like a concert hall. The collaboration of that noise isolation with Bentley’s phenomenal work on ride control and quality is what makes Bentayga feel very special, though. I improvised a drive route through the hilly country that surrounds Lime Rock Park, finding road surfaces almost as varied as those I travel every day in Michigan. And on high crowned, cracked, pitted back roads, Bentayga offered a filtered and sinuous experience, as if there were a layer of crushed velvet between tire and paving. That’s no mean feat on 21-inch wheels and rubber band-sidewalled tires. Bentley is rightly proud of its world’s-first 48-volt electric anti-roll bars, so much so that it rented outt a track to show how stiff and stable the large SUV feels under my manhandling. But the Bentley Dynamic Ride seems far more impressive to me on a rapid drive over some twisting public roads, where it effectively masks the two-and-a-half-ton curb weight amidst some hot cornering. Overall there’s a fluid, natural, neutral experience when driving aggressively that’s not only impressive for an SUV, it’s impressive for a Bentley. And that’s kind of the point. This is an SUV that is fast and unflappable in 99-percentile use cases, with a little capacity left over around the extreme edges of driving situations. I was impressed that the Bentayga didn’t wallow around Lime Rock, even when driven as few owners will frequently choose. And, though I didn’t have any more off-road experience than a well-manicured lawn and a bit of gravel driveway, I’ll give the benefit of the doubt that Bentley’s claims of proficiency are true – I’m certain the sand mode has been adequately vetted for inevitable oil-rich buyers. The point is this is an SUV that is fast and unflappable in 99-percentile use cases, with a little capacity left over around the extreme edges of driving situations. 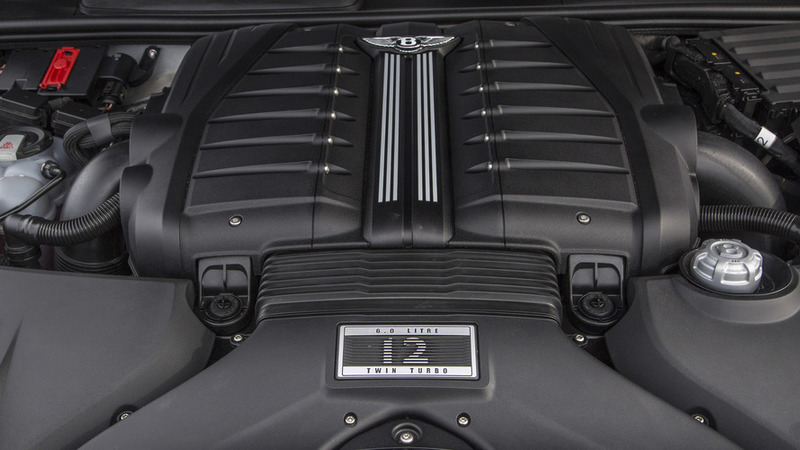 The W12’s thrust is managed by an eight-speed automatic that does a great job of keeping quiet and out of the way. There are paddle shifters – thankfully not the preciously positioned stalks from the Spur – but the sport mode programming is all that’s needed for quick kick downs. Manual mode feels like something for lesser vehicles. Forget for a moment that nearly every option comes at the cost of a used Civic, and enjoy the decadence. Behind the tiller the big motor did a fine job keeping me alert and attentive to the fast-passing roadway, but every other seat in the house is fine to fall asleep in. Bentley is perhaps challenged only by Rolls-Royce in jaw-drop factor for its cabins, and the Bentayga doesn’t disappoint here. Wearing the optional four-seat configuration; rear seat entertainment package; heat, cooling, and massage for your backs and bottoms; and every manner of wood, leather, metal and good-feeling surface, this is truly a palace on wheels. Forget for a moment that nearly every option comes at the cost of a used Civic, and enjoy the decadence. There’s a reason why rich people love handmade things, as the elegance and sturdiness of craftsmanship shows in this lush environment. 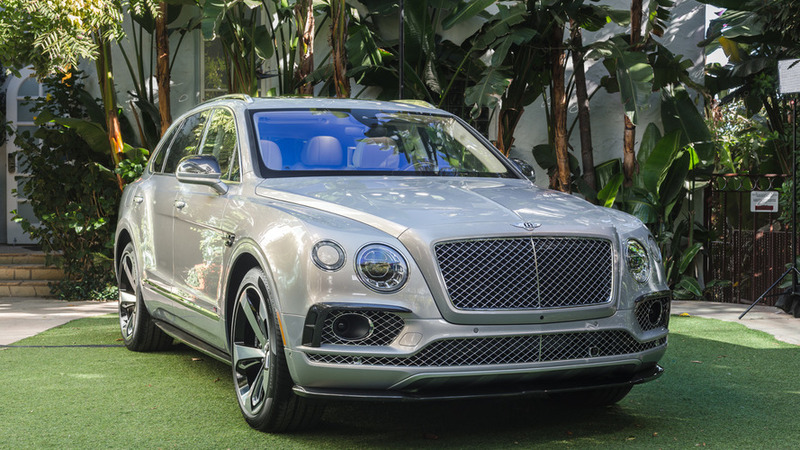 An environment ripe for customization, the Bentayga’s $229,100 starting price is merely a good start. If you’ve read anything about this SUV to date, chances are good it revolved around the salacious price of the optional Mulliner Tourbillon by Breitling. The optional clock – which wasn’t on hand for me to steal investigate – runs north of $150,000. That’s a dash clock for right around the same price as one of Bentley’s quasi-competitors, the Porsche Cayenne Turbo S. Slightly less are the optional Event Seat and picnic boxes. The seat is a stowable, leather-bound ode to high-end tailgating, and asks more than $3,000 for the pleasure. The picnicking gear includes cut crystal, a full set of silver and china for serving, and a very downy looking Bentley blanket – yours for a mere twenty large... and some change. The Bentayga hails a new era for the company and fabulous new way for the motoring elite to hit the road. At those prices – my tester had $1,980 worth of contrast stitching – it’s easy to poke fun at the ways in which wealthy folk part with their money. But the truth is every square-inch of the car feels crafted, not assembled, and there’s a cost associated with that richness and quality that sometimes boggles the minds of we commoners. Some days I may drive a Camry, but I don’t mind kicking it with a one-percenter options list occasionally, either. The part of me that reveres tradition and desires that only sports cars be fast can’t stand that Bentayga exists. But that part of me is hardly worth listening to after actually driving the thing, perhaps the best and most complete Bentley experience one can now buy. Fast, rare, and impeccably finished, the Bentayga hails a new era for the company and fabulous new way for the motoring elite to hit the road.